1947 : At the end of the war, the vessel La Pampa was Buries Markes’ sole vessel, but not for long. Another vessel delivered by William Doxford, La Cordillera, with accommodations for twelve passengers. 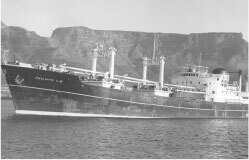 1948 : The vessel Empire MacDermott, used for airplane transportation since 1944, is transformed into a cargo ship and renamed La Cumbre. 1950 : Around the same time, a 8,500 dwt cargo ship, Philippe LD (I) is ordered at Uraga, Japan, and in 1951 the 9,350 dwt Pierre LD (II) is launched at Dunkirk. These vessels operated on the Southern America line, and transported grain and diverse cargoes. 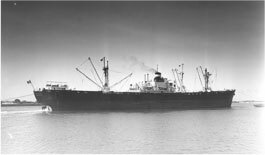 1951 : The vessel Fort Spokane is bought by Buries Markes to become La Orilla. A second vessel built in 1940 is renamed La Estancia (III). Mardene, built in 1947 becomes La Quita, and Empire Envoy built in 1942 is renamed La Orilla (II). 1952: Four 9,500 dwt vessels were launched in St Nazaire: Léopold LD (III), François LD (III), Gérard LD (I), Robert LD (I). They were destined to serve on regular line Plata-Golfe. The Liberty Ship Ouistreham from the Messageries Maritimes was transferred to the LD fleet in 1955. These ships would be LD’s last “classics” to operate on regular lines with surviving vessels from World War II and the transition fleet. The Can-Con (Canada-Continent) and Can-Med (Canada-Mediterranean) lines were operated in parallel with Montship and Capo Line/GENS/Sagital. It would then be the Gulf-SA line’s (Gulf of Mexico/East Coast-South Africa) turn to be abandoned after the first closure of the Suez Canal in 1956. A few vessels were transferred to the SEAS line, the Southern America line. It will be LD’s last participation on a regular line service, however continued by its Italian subsidiary GENS/Sagital. 1953 : New ships entered the LD fleet. Firstly a Liberty Ship renamed La Loma, then two new fast vessels with a capacity of 10,000 dwt, La Hacienda and La Chacra. 1954 : Philippe LD (1950), Jean LD (1935), Louis LD (1936) were all transferred to the Buries Markes fleet, thus becoming La Ensenada, La Laguna, La Quinta (II). 1955 : The brand new La Orilla(III) enters the fleet followed by another one built in 1940 by Doxford, and renamed La Barranca. A new vessel built at Saint Nazaire with a rear engine, La Pradera, is launched in 1956 and is identical to Jean LD (II) and Louis LD (III). 1956 : LD, already a partner in Montship, officially takes control over its entire fleet. All the vessels’ names start with “Mont” such as Mont Gaspe, Mont Clair and Mont Sandra which were operated by Buries Markes.